In a previous post, I wrote about how to use Twilio to send an SMS message. This time, I'm going to show you how you can use Twilio in conjunction with a web app to answer phone calls made to your Twilio phone number. First, you will want to have a Twilio developer account. If you did not create one last time, go ahead and create one now. The Twilio dashboard provides a place for you enter an address to send HTTP POST requests. Using the App.HandleSpecialURL event handler, you can send these requests to a web application running on a publicly available server. To get started, you need to create a web application. In the App object, go to the HandleSpecialURL event handler. This event handler has one parameter: Request As WebRequest. You can use this parameter to handle the request sent by Twilio and to send information back to Twilio. Twilio uses something they call TwiML (Twilio Markup Language), which is essentially XML with Twilio-specific commands. Notice that I have not created a web page. That's because this web app won't use one as its only purpose is to handle direct requests using HandleSpecial URL. Give this app a name (TwilioCall), built it as a standalone app (or CGI if you prefer) for your deployment platform. 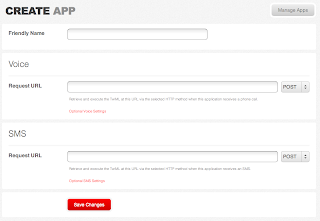 Now you need to configure Twilio to use this web app. 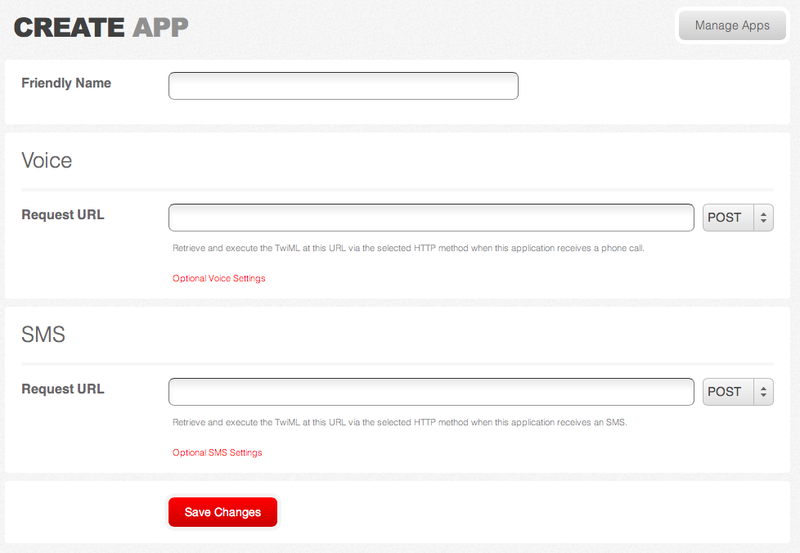 Go back to your Twilio Dashboard and navigate to Dev Tools and select TWIML apps. Click "Create TWiML App" to create a new app. With all this in place, you can now call your Twilio phone number. Twilio will then send a request to your web app which will respond by sending back a request to speak some text and the current time. 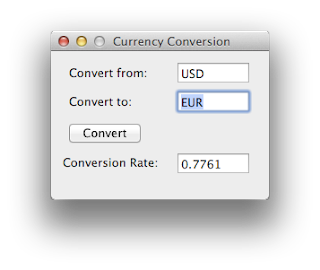 An example project demonstrating this will be included with Xojo and is also available here. Some of the most common questions I get from new users relate to using databases with Real Studio. We've got lots of tips and tricks on how to connect in our Documentation and videos too. In addition to having it's own RealSQLDatabase for single user applications, Real Studio supports database server connectivity for Oracle, ODBC, Postgre, MySQL, Microsoft SQL (Windows only). One thing to watch our for when connecting to Oracle or Microsoft SQL Server is to make sure that you are using 32 Bit versions of Oracle Instant Client or Native Client Installer for MSSQL instead of the 64 Bit versions. Real Studio currently build 32 Bit applications and cannot use the 64 Bit libraries. Once Real Studio builds 64 Bit apps you will be able to use the 64 Bit libraries. You can read more about the schedule for 64 Bit in this post. I've been asked from time to time if it is possible to send an SMS message from your application. SMS stands for Short Message Service and is also commonly referred to as a Text Message or just a Text. SMS messages can contain up to 160 characters. To send someone an SMS, you just need their mobile phone number. So is it possible to send an SMS message from your apps? As is the case with most things, the answer is "Yes, if you know how". And often many of these things can be accomplished using a web service of some kind. One of the easiest ways to interface with telephones, including SMS, is using a web service called Twilio. With Twilio, you can do all kinds of things related to telephones, including making and receiving phone calls and text messages. Twilio is not a free service, but you can get a free developer account with a credit to test it out. On this page you will see buttons with examples for a variety of languages. You can just click XML to see how to do this using XML and curl, which you can easily incorporate into your app. When Xojo is released, it will include a sample project that demonstrates how to do this using just a few lines of a code and a handful of controls. 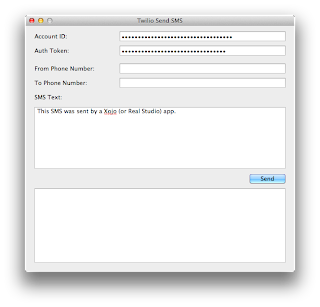 The app uses curl (from a Shell) to send the SMS so it will only work on OS X and Linux. The code is entirely contained (all 6 lines of it) in the Action event handler of SendButton. This code takes what was entered in the window and creates the curl command (as described on the Twilio page) and then runs the command using a Shell. The XML results are displayed after the message is sent. You can also download the sample project from here.